By popular request the Legacy Streams feature is back! I’m giving the Streams page https://legacy-wow.com/streams/ a second chance. This is a feature I created about a year ago that was well received. 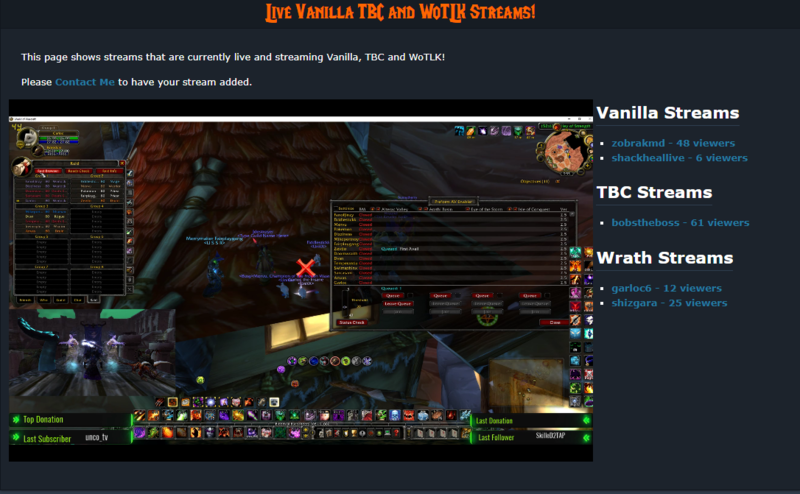 The page makes it easy to find Vanilla/TBC/Wrath streams that are currently live. I previously had a pretty large list of streams with additional streamers asking me to add them every day. Alas, shortly after creating the page Blizzard began cracking down on legacy streams. This was around the time the community was making a lot of noise, right before we got our big announcement. I’ve been told that Blizzard has been a little more relaxed with streamers. Due to that and since this feature was a hit previously, I’m giving it another chance. Also, send me emails if you would like your personal stream (or a stream you enjoy watching) added. Note: Streams only appear when they are live, so if your stream is added it will only appear while you are streaming.